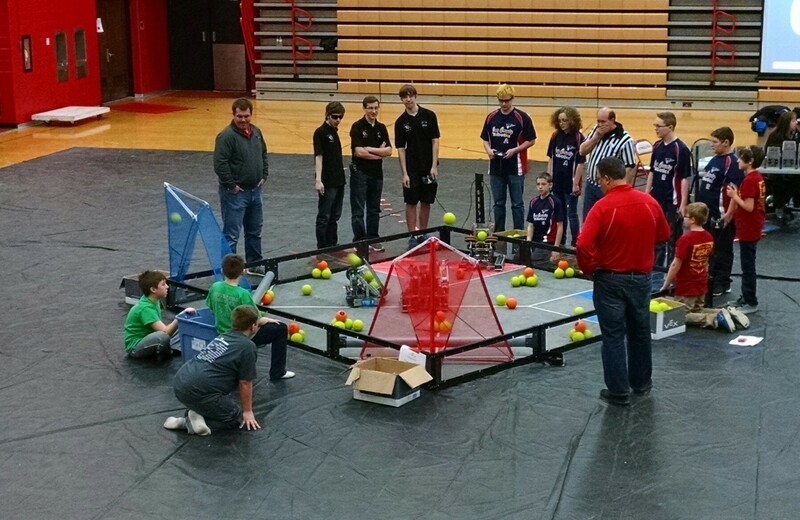 Because of my position on the Marshall County Community Foundation (MCCF) Grants Committee, I was fortunate enough to see the beginnings of the Robotics Club at Plymouth High School. I knew Principal Jim Condon as a fellow Marshall County Economic Development Corporation (MCEDC) Board Member. He introduced me to Josh Kuhn and Kennedy Schneider, two Plymouth High School students who, without the knowledge of the school, entered and won the State Vex Robotics Competition. (I found this article discussing the original team in the South Bend Tribune. I’ve embedded a link to them winning the State Championship below.) The School then helped them move on to the World competition in California. The school then applied for a grant from MCCF to start a formal robotics club the following year. I vetted the school’s grant application for a robotics program and was pleased to champion it with the MCCF Grants Committee. MCCF awarded them a significant grant to begin the program. Coming full circle, Principal Condon told me last Friday that three years after that start-up, Plymouth High School’s Robotics Club would be hosting a northern Indiana competition on Saturday and would be fielding six teams. The event ran from 9 until 4. Due to other commitments I could only go for the afternoon. Becky and I got there about 1:30 and as it turned out, that was about right as we were in time for the to see the team selection process and the beginning of the elimination rounds. Principal Condon was kind enough to take a few minutes to sit with us and update me on the status of the program as well as tell us a little about what we were seeing. The teams were ranked and then through a school yard pick, divided up into teams of three. The teams then competed head to head for two out of three wins in competition matches to advance to the finals. I don’t think I could do justice to a description of the competition here. Suffice it to say it was a combination of driving skill, defense, ball collection and ball shooting skill as they collected balls around the arena and attempted to get them into the goal net. 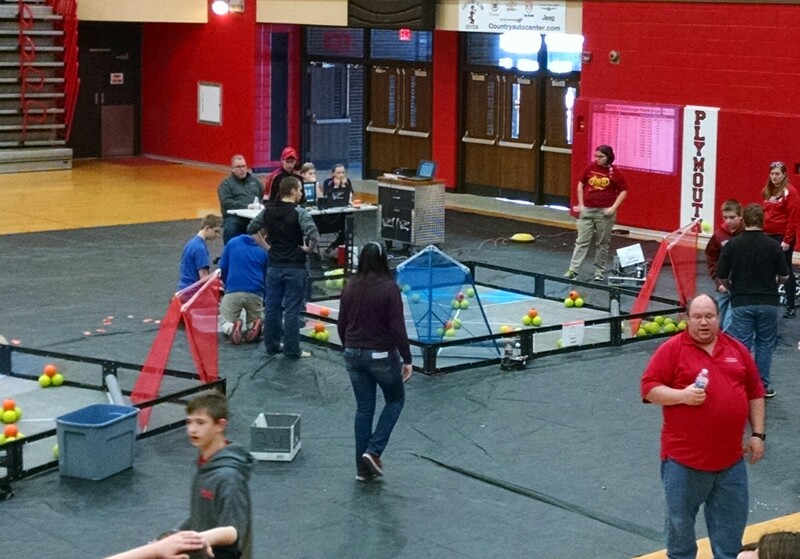 The robots shot the balls using impellers, catapults and paddles. The students were given specifications and a parts list they could use last summer and then they spent months developing CAD models of their robots. They are required to provide a detailed manual describing the design process and the construction process which is part of the judging process. At competitions they are judged on not only their competence in the arena, but on style and presentation. I’m probably unjustified in being proud of the very small part I played in helping with this. But seeing the enthusiasm of the kids and the obvious pride they have in their efforts was heartwarming. I’ll have no problem going back to MCCF and telling them that the grant money invested in the program was well spent. 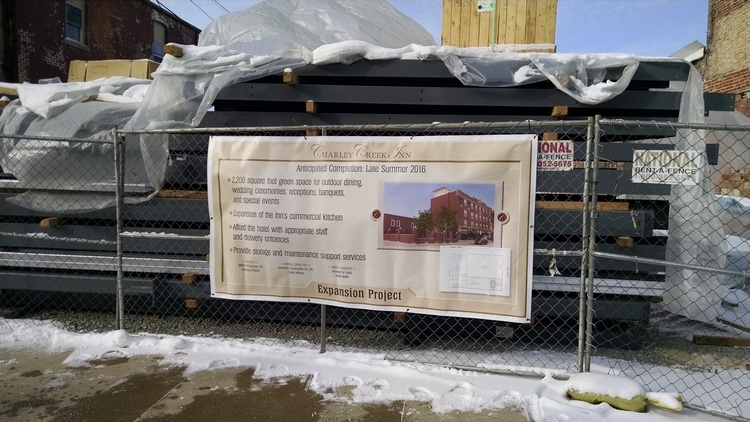 The marketing department at Charley Creek Inn put together a nice site sign for the project. Thanks guys! We appreciate the acknowledgement. The banner format is a nice idea we haven’t tried before. It will give us some options for moving it around as the project progresses. I hung it on the construction fence at the east side of the project for now. Looks good! One of my best friends, Kim Whitten, is a lurker here. Since I am HORRIBLE about proofing my own work*, I always ask her to tell me if she finds any errors. Recently she pointed out that I use two spaces after periods, which was old “typewriter thinking” and if I didn’t want to show my age, I should stop that. This was the first I had heard of this, so immediately I assumed that this was a product of Twitter and Texting, where you have limited characters. Surely formal writing should still observe the two space rule I’d learned in school? Nay-nay! Kim sent me to the Cult of Pedagogy website where I read a couple of articles on the subject (here and here) along with a sometimes heated comment argument thread. Apparently this has ALWAYS been wrong. It’s a product of the manual typewriter era, when the original typewriters produced documents in a monospace font style without proper kerning for the skinny letters like “i” and “l”. I went to my favorite snide grammar guide, “The Oatmeal“, but he let me down on this one. A little more looking took me to Slate. It would appear that those in the single space camp are quite the Nazis about it too, as illustrated by this quote in an article from Slate: “Forget about tolerating differences of opinion: typographically speaking, typing two spaces before the start of a new sentence is absolutely, unequivocally wrong,” Ilene Strizver, who runs a typographic consulting firm The Type Studio, once wrote. “When I see two spaces I shake my head and I go, Aye yay yay. I talk about ‘type crimes’ often, and in terms of what you can do wrong, this one deserves life imprisonment. It’s a pure sign of amateur typography.” Hmmmmm… If Ilene ruled the world, I would be serving multiple life sentences by now. I’m not sure why I chose to take typing in high school, other than the fact that I didn’t like study halls and it fit my schedule. Whatever the reason, I will be forever glad that I did. I make a point of recommending typing class to any kids that I might influence. I think it’s unfortunate that typing is falling out of vogue due to the use of texting on phones and the hunt-and-peck writing used by most tablets. (I’ve ranted about that in the past.) I still think it is one of the most useful tools that I learned in high school. It is a skill that I use daily. 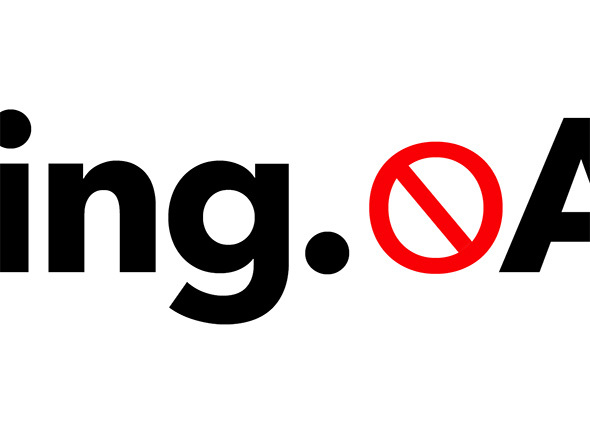 And for that reason, changing from two spaces to one is going to really slow me down… There will be a lot of backspacing to remove that extra space. The double strike of the space bar by my thumb at the end of a sentence is just too ingrained. Far be it from me to want to appear old-fashioned and outdated. I will do my best to lose the double space… going forward. It is definitely not worth it to me to go back and “correct” things I’ve written in the past. The thought that I could be judged negatively on this is somewhat mind-blowing, but stranger things have happened in our politically correct world. I don’t want to be doing hard time if Ms Strizver or some other typesetter becomes emperor of the world! * Somehow my brain seems to go into autocorrect mode when I read something I’ve written. I know what I meant to say, and I gloss over my errors as if they weren’t there. Conversely, when reading someone else’s work, if I run across one spelling or punctuation error, I immediately and irretrievably slip into proof-reading mode. I am picking up on every mistake along the way while struggling to get back to reading the content. For those of you that missed the Vision Meetings in Argos and Culver, there is another opportunity to attend and voice your opinion. A third Town Hall Meeting is being held in Plymouth this Saturday. See the flyer to the right. I have also included the text of a press release MCEDC is sending out to the local media below. This is an important topic as we make decisions on how to move Marshall County forward. I hope to see you there! Plymouth, IN (February 3, 2016) – The Marshall County Economic Development Corporation (MCEDC) will be holding a Town Hall meeting at the Plymouth Council Chambers this Saturday, February 6th at 10am. The meeting will address the Marshall County Vision, an effort supported by community leaders and a citizen’s group of 120 members and growing whose goal is to improve the quality of life of all Marshall County residents. The Marshall County Vision is an initiative aimed at raising awareness of the needs that our community faces and building consensus on the ways in which we can securing funding and implement long-term development plans to meet these needs. Specifically, the long-term plans proposed by the initiative will require $27 MM in funding for community development and $52 MM for county-wide roadwork. These funds will be used to extend the Metronet, improve infrastructure, create more affordable housing, increase workforce development efforts, and repair and maintain 911 miles of road in Marshall County. Since the Vision initiative began last summer, MCEDC has presented it to elected officials and at 7 service organizations across the county, as well as Town Hall meetings in Bourbon, Argos, and Culver. These meetings have resulted in greater support for the Vision initiative, and we hope the upcoming Plymouth Town Hall meeting will do the same. More importantly however, these meetings have given community members a chance to voice their opinions and build consensus on the development plans which will impact our county’s future. 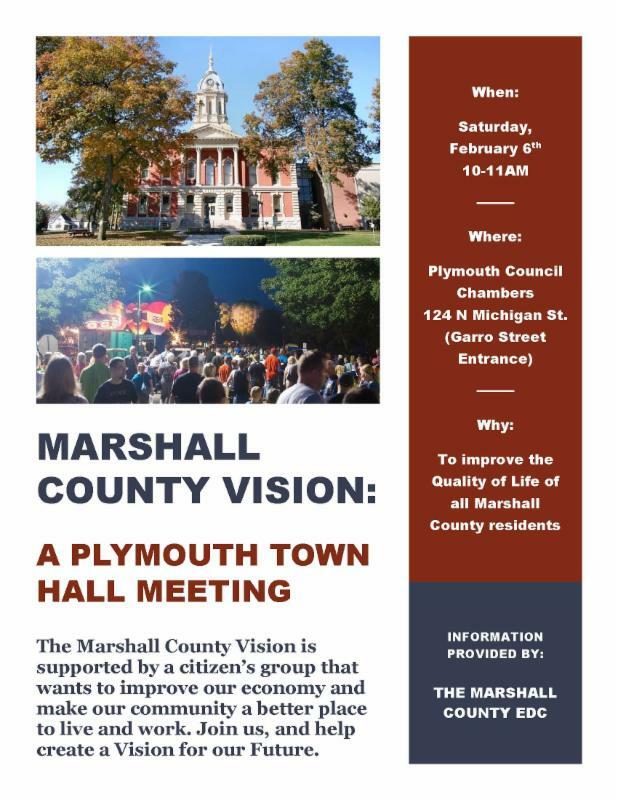 All Plymouth residents are encouraged to come to the meeting and learn how they can make Marshall County a better place to live and work for years to come. 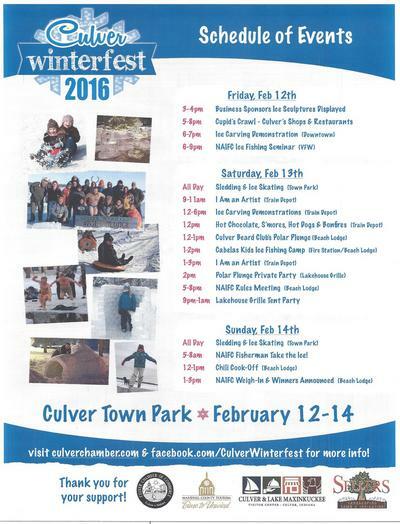 For more information, please contact Jerry Chavez, President/CEO, at (574) 935-8499. The Marshall County Economic Development Corporation (MCEDC) is the lead countywide economic development organization servicing Marshall County, the City of Plymouth, and the Towns of Bremen, Bourbon, Argos, Culver, and LaPaz. MCEDC’s mission is to expand and diversify the economy of the county and its communities by fostering investment in new and existing businesses and creating entrepreneurial capacity. Visit MCEDC on the web at www.marshallcountyedc.org, like us on Facebook, and follow us on Twitter.